Destined to be a chef, at the age of fifteen Matteo began his formal education at the Instituto Alberghiero “Pastore” at Varallo Sesia. He paid the tuition by hunting porcini mushrooms and fishing and then selling his finds to local restaurants. He graduated in 1986 and was driven to learn from the best. He began working for free in Milan at the famous “Savini” Restaurant in The Galleria, just to learn the “art of the Risotto” from Chef Fulvio Lavarini. After working in Milan, it was time to see the rest of the world. Matteo began working for the award-winning Princess Cruises. For the next 14 years Matteo worked his way up from a Galley Helper to an Executive Sous Chef learning how to cook all types of international cuisine as he traveled the World. He worked on famous ships such as the Original Love Boat and the Royal Princess, where he served Princess Diana and Queen Elizabeth II. To gain even more experience, Matteo took a few years off from the high seas and went to Paris where he became a line cook at Enoteca. Two years later, Matteo went to London, beginning his first Executive Chef position at Osteria Pulcinella, a very popular and authentic Italian Trattoria where he started to make a name for himself. Eventually Chef Matteo was lured back to the sea, working for Princess Cruises, where he met his business partner, Alisa Ferrari. Matteo and Alisa first started a full service catering company Matteo In Your Kitchen in 2003 that caters to both large and small events up and down the San Francisco Peninsula and is thriving today. In May, 2005 Matteo and Alisa opened the restaurant Stella Alpina Osteria in Burlingame, California. At Stella, Matteo continues to delight customers with his rustic sauces, braised meats and risottos in a cozy and inviting setting. 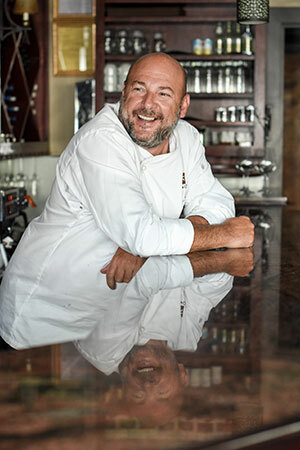 After over ten years in business, Matteo's dream of having customers dine as if they are in his own home is a reality and his customers can't get enough of Matteo's rustic Italian flavors.